Like ProView 1 & 2 also ProView 3.1 displays a preview of the ProLace embroidery in a separate window. ProView 3.1 includes all the ProView features of ProView 1 & 2, but it enables the user to simulate also advanced embroidery effects like Laser / Thermo cut, Cord and Soutache. ProView is an important companion for the ProArt Designer and the ProLace Puncher. It displays the embroidery already during the design or punching process, so that the user gets an overview of the whole design, independent of the zoom factor, which he is actually using in the ProArt or ProLace editing window. In some complex designs is it very difficult for the puncher to imagine the outcome specially of repeat change and needle pattern. Not so with ProView! ProView directly shows the puncher the effect of color change, repeat change and needle programming. Alternate needle colors, specially in combination with color change, are hard to imagine for the puncher too. Also in this case ProView can help. In order to get a photo realistic preview of the embroidery is it possible to define the thread of up to 60 needles. In ProView 3 you define the thread of each single needle. For a thread you can define the color, the intensity of the shadow and of the highlighted part and the width. In this way a thread can appear glossy like a polyester thread or matt like a cotton thread. Designs with sequins are a big problem for the most viewers on the market. Not so for ProView. It can display also sequins, which exist in your design. The color can be defined, the size and shape are taken over from ProLace. 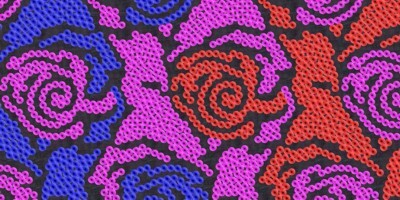 The Sequin color can be defined for every repeat of the simulation. This allows you to simulate also alternate color Sequin designs. Soutage and cord yarn can be scanned and saved as bitmaps. A cutting mask specifies the area to cut out the fabric. The area will be displayed in the defined background color. Masks can also be used to create large holes in the fabric. Via a second mask you can define the Laser / Thermo cut area. The area will be displayed as second fabric. For the background you can define a solid color, but also bitmaps can be used as background. ProView 3 comes already with a number of backgrounds like tuell, linen, cotton, but can also scan your own fabrics and use them as background. 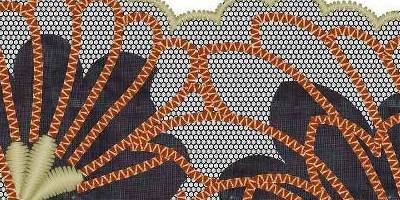 Due to the thread pull embroidery objects like edges and blattstitches appear smaller in reality than on the punched design. ProView considers this fact and allows you to define how much the thread pull is compensated. Also bored areas are displayed correctly. The bored are is filled with the mask color. In order to optimize ProView for your needs is it possible to specify the image resolution. Values between 72dpi and 300dpi are possible. You can also choose between the 3 display modes Draft, Normal and 3D. The Draft mode is used during punching. It is the fastest mode, but no background and no thread width are displayed. In the Normal mode you can produce images like in ProView 1 with thread width, solid background and solid thread. The best results can be achieved in the 3D mode, which enables you to generate a photo realistic image. Also bitmap backgrounds are supported in this mode. In case of computer systems with two monitors, one monitor can be used to display the ProLace screen and one monitor can be used for the ProView window. This can spare valuable space on the ProLace screen and give you an even better overview due to a bigger preview window. Display of a preview of the ProArt or ProLace design in a separate window already during the design or punching process. Display of the actual ProLace zoom. Display of the effects of color change, repeat change and needle programming. The threads of up to 60 needles can be separately defined. Up to 9 repeats can be displayed. You can define the color, highlight, shadow and width of a thread. The base fabric can be defined. A solid color or a bitmap can be used. A second fabric can be defined to show the Laser / Thermo cut areas. By means of masks can you specify cutting areas in the fabric and Laser / Thermo cut areas. ProView can compensate the effect of thread pull. Borer sections are displayed correctly. Can display Sequins also with alternate colors. Can display Cord yarn and Soutache. You can choose between the display modes Draft, Normal and 3D. Support of systems with two screens. The design can be saved as BMP or JPG file. The design can be printed in original size.